If you’re been a PC gamer for the past 5 years or so, it’s probably been a while since you last purchased a new game title in a physical store, thanks to the rise of Steam and the internet. And given the fact that you can pickup most games for extremely good bargains in Steam sales nowadays, unless you’re a collector, there’s not much incentive to go outside to buy your games anymore. 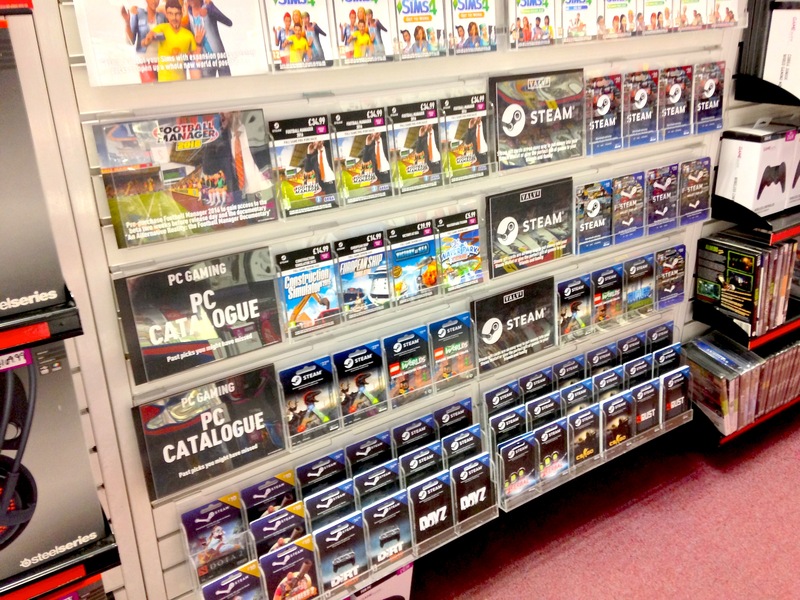 It’s also fair to say, at least if you’ve been to any major game retail store in the UK, that the support for the PC Gaming market has been pretty non-existent for a good part of the past decade, with PC titles usually shoved to the back corner and consisting mainly of cheap ‘simulator‘ titles that even PewDiePie hasn’t heard of. Last month, Valve launched their Steam Hardware product lineup, and with that, they also announced that Steam sections would be officially coming to a range of retail stores in the US, UK and Canada. 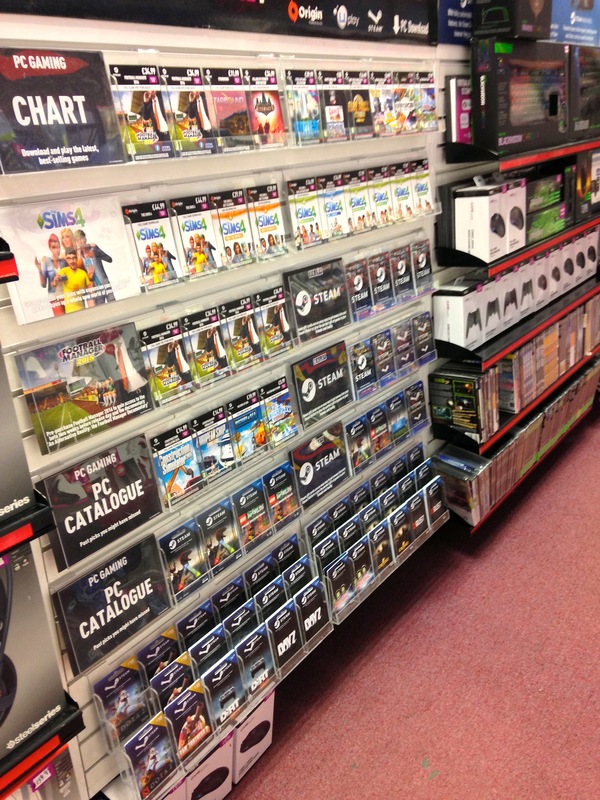 Stores include Gamestop, EB games and GAME UK. 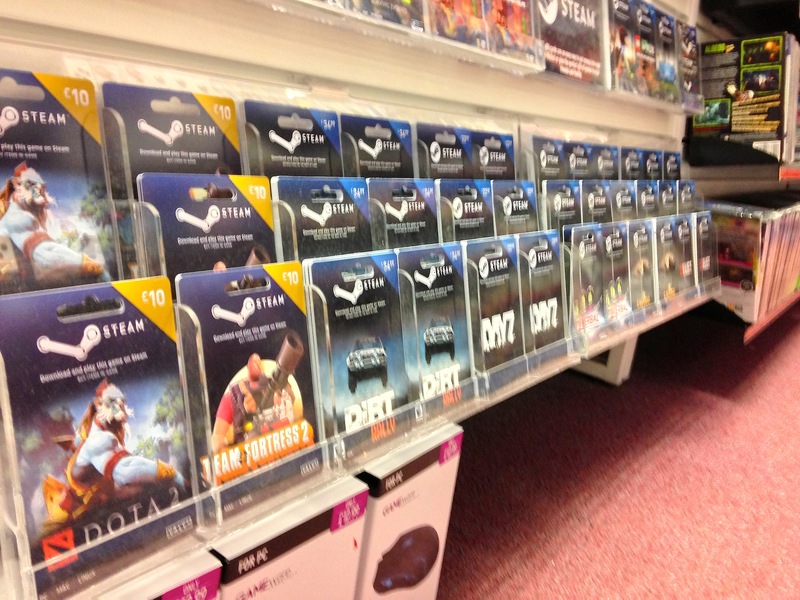 As you can see, at least in this example, Valve have taken up pretty much an entire isle of the store with official Steam branding, what was even more surprising was that this was right at the front, with plenty of shelf space dedicated solely to PC gaming. You can also see the Steam Link, Steam Controller and Alienware’s Steam Machine advertised on the isle boards, which gave the impression that Valve are pretty serious about competing with the neighbouring Xbox One and PS4 isles. There was also a ton of third-party accessories from the likes of Razer and Steelseries on sale too, although we were unsure if this was part of Valve’s deal, nevertheless, good to see. 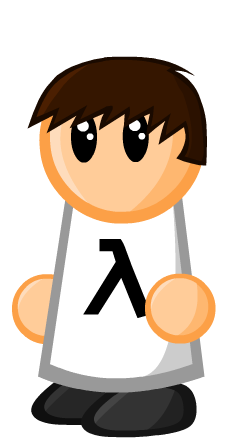 The biggest addition, though, was by far the new range of Steam game gift cards that you can buy to top-up your Steam wallet. As well as the generic Steam gift cards, which have been on sale for sometime, there are now cards for official Valve titles, including CS:GO, Dota 2 and Team Fortress 2 as well as a large range of popular Steam titles such as Rust, Kerbal Space Program, Eurotruck 2, DayZ and Cities Skylines. It’s certainly a big step for Valve to break into the retail space like this, especially with the the majority of their business model for the past decade being revolved around the digitalisation and redundancy of physical game sales. For anyone who’s been around since the start of the millennium, it’s also a spell of deja vu to see major PC titles being at the forefront of local game stores. 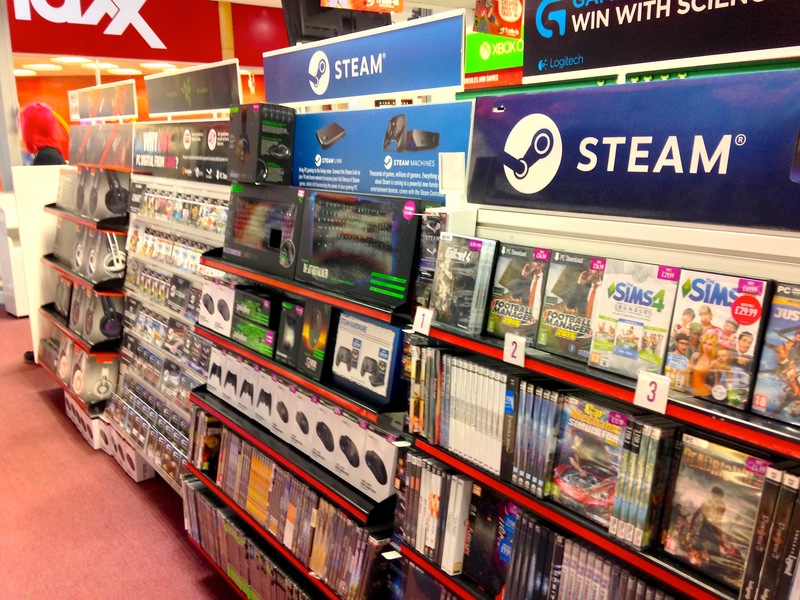 Nevertheless it’s certainly good to see the retail world giving PC Gaming some attention. What are your thoughts? Is this the last efforts of game stores to stay alive, or is this Valve’s utter desperation to enter the living room market? You decide. Update: Seems quite a few people shared their thoughts on Tumblr, click here to read.